The USB Multimeter PeakTech PKT 3315 is equipped with an automatic range selection as well as the option to select the measurement range manually. 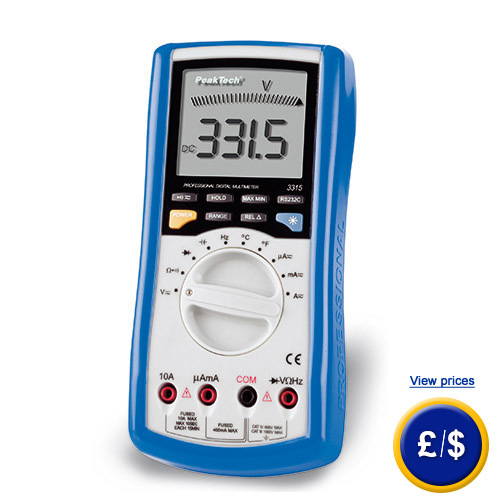 Further the USB multimeter PeaktTech PKT 3315 features a dual display that indicates a maximum of 3999 figures in a 40-segment analogue barographic display. Thus the values can be shown clearly and easy to read and alternations can be detected quickly. Besides conventional measurement functions, such as current and voltage, the USB multimeter can also detect capacity, frequency, resistance and temperature. The USB multimeter measures frequencies up to 400 MHz, temperatures up to 1000 °C and current up to 10 A. Due to the standard optical interface the USB multimeter can be connected for the purpose of macro recordings to a computer, in order to record and monitor dynamic data. The USB multimeter PeakTech PKT 3315 indicates alternations of waveforms in real time. Furhtermore the USB multimeter is equipped with a backlit display and an entire input protection. The buttons at the USB multimeter supprt an easy, direct and above all simple selection of basic functions. The automatic range-selection is available for: DCV, ACV, DCA, ACA, Ohm, diode, continuity, capacity, frequency and temperature measurement function. If there are any questions about this USB multimeter PeakTech PKT 3315 please have a look at the technical specification below or call: UK customers +44(0) 23 809 870 30 / US customers +1-410-387-7703. Our technicians and engineers will gladly advise you in all multimeters and all products in the field of measuring instruments, regulation and control and scales. ± 0.8 % + 1 dgt. ± 1 % + 2 dgt. ± 1.0 % + 5 dgt. ± 1.5 % + 5 dgt. ± 1.0 % + 2 dgt. ± 4 % + 3 dgt. ± 1 % + 3 dgt.